Beauty blunders... we all make them. Hopefully we learn and move on. Whether it's a dye-job gone awry or parachute pants, I know you've got one. What was your worst beauty blunder? Mine? I've had a few. Bowl cuts, bad perms, clothes that were either way too big or way too small. But this may be the worst. My hubby and I were invited to a friend's Christmas Tacky Sweater Party. 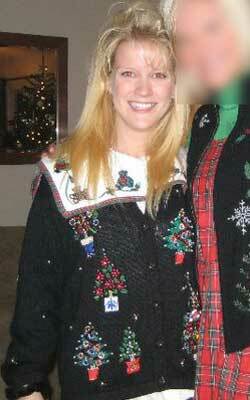 Instead of just a tacky sweater, I wore tacky hair, a tacky shirt and a tacky sweater. CJ didn't even want to be seen in the car with me on the way to the party. So when in doubt, scale back and remember that there are ALWAYS cameras present when you look your worst.